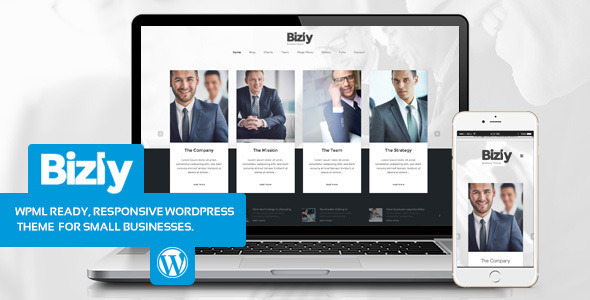 Bizly – Lawyer and business theme for small companies Created by Bebel. This templates have specific characteristics, namely: Bizly has features such as High Resolution: Yes, Widget Ready: Yes, Compatible Browsers: IE10, IE11, Firefox, Safari, Opera, Chrome, Compatible With: WPML, Software Version: WordPress 4.2 . You can use this Bizly – Lawyer and business theme for small companies on WordPress category for accountant, attorney, business, clean, company, finance, firm, human resources, law, lawyer, manager, mobile friendly, simple and another uses. Attention law firms and small to medium sized companies! When we designed Bizly we had you in mind. We know that your firms often need no more than a very professional website without all the feature overload and the same and boring default layout of todays templates. That doesn’t mean of course that we didn’t equip Bizly with the tools that you need to work properly but we didn’t include 50 homepage variations and a ultra complex backend that makes you lose faith in humanity. Bizly is customizable – but it will always look as good as it does in the demo even without tons of content! It is fully responsive, supports child themes and works with the wpml plugin (that means it is multi language ready). There are also nicely designed sub pages that show off your team and clients in a nice way and we added our popular mega menu. And if you run into trouble our doc will help you find answers and if thats not enough we will help you in our support forum. There is also a XML file with some dummy content to get you started quickly.